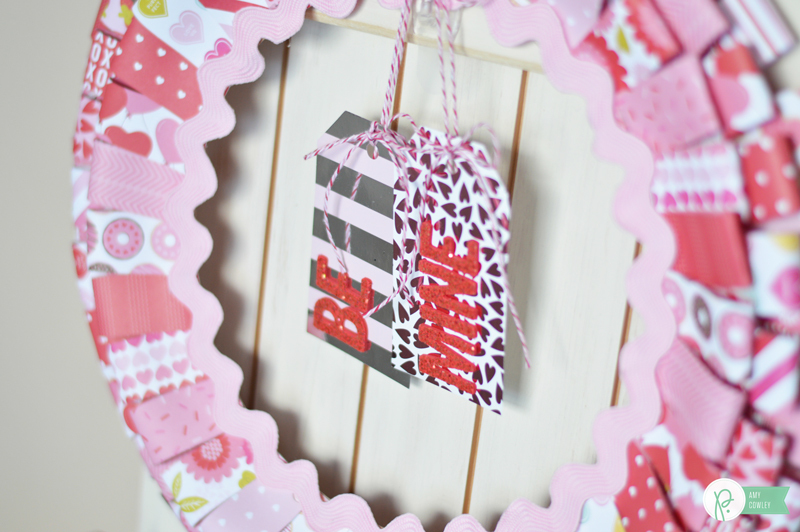 Be Mine Archives - Pebbles, Inc. 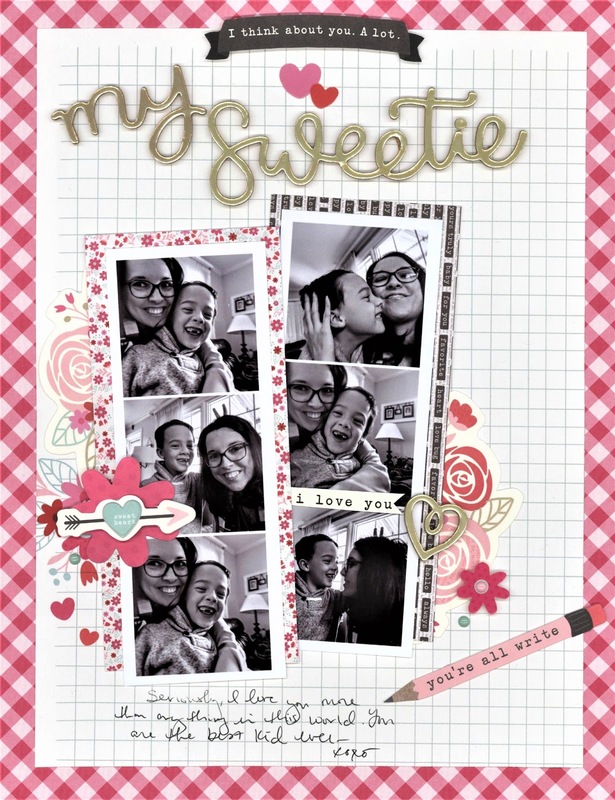 Guest Blogger Nicole: Love you more! Good morning everyone! 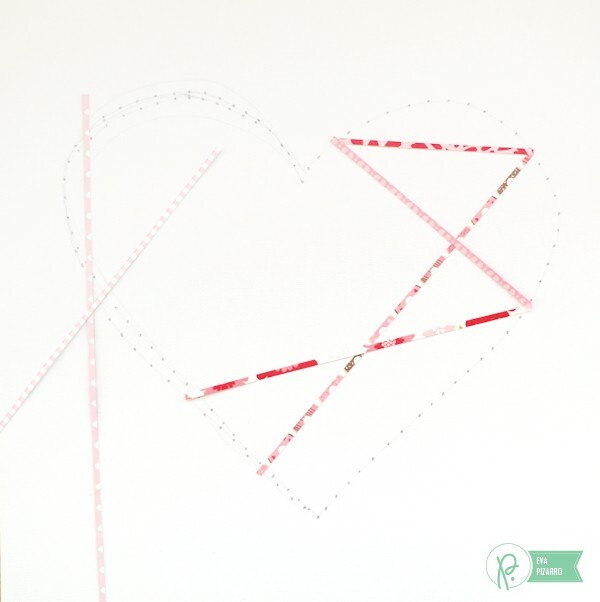 I am so excited to be guest designing for Pebbles Inc. this month! 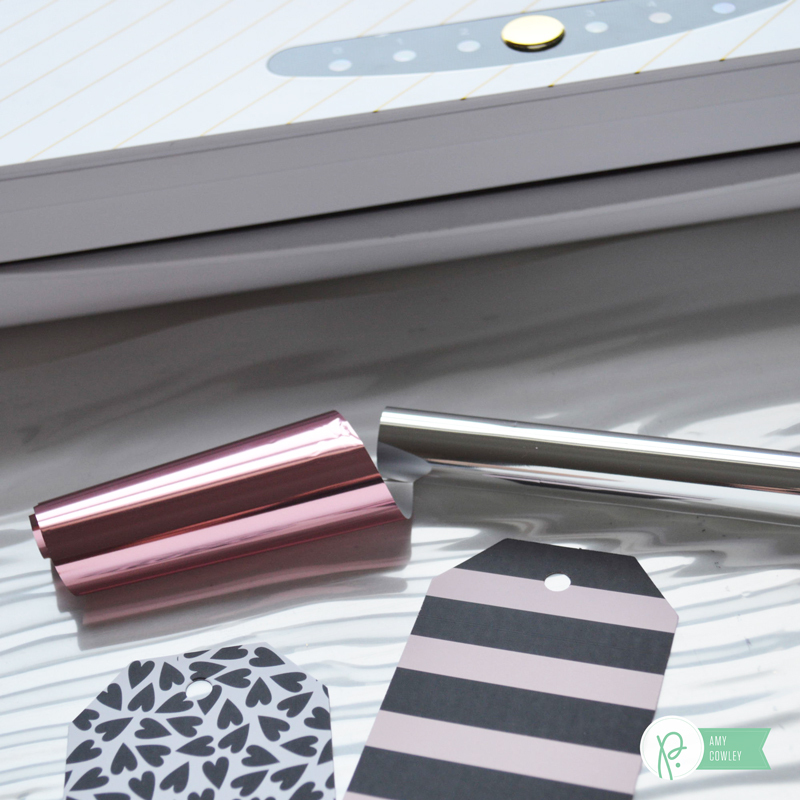 I just love Pebbles paper products. 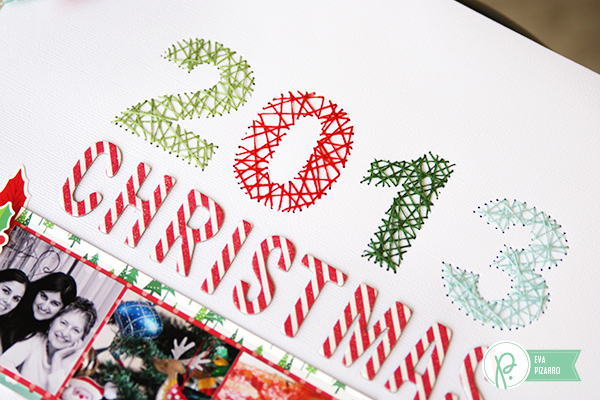 Seriously, the embellishments and papers are all so fab. I’ll be honest, I opened my box and sighed with contentment, looking at all the gorgeous contents. This month, I had the pleasure of working with the Forever My Always. Since I didn’t want to leave anything out, I used a little of everything! I started by creating this layout of my hubby and I. I took these selfies on New Years Eve. They aren’t perfect photos, but I still love these photos. What a great night! 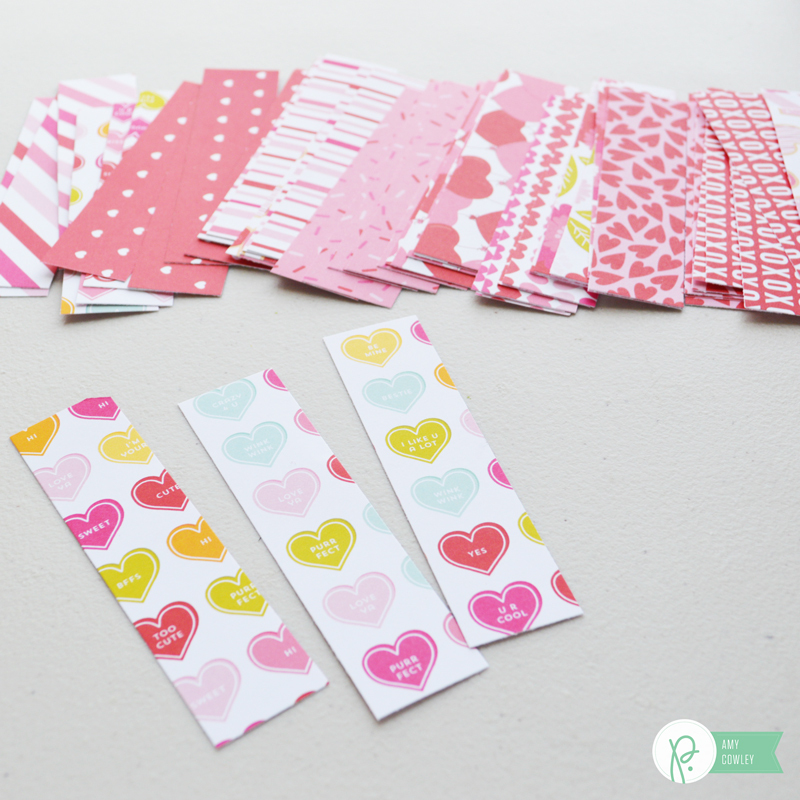 I love the cut apart sheet with all the sentiments so I hand-cut a few of the sentiments and used them to create a fun, grid layout. Then I tucked a few die cuts and stickers here and there to fill in the white space. I tore the xoxo paper to create a nice border for the layout. I love incorporating a variety of textures and shapes on my projects; totally fun! Every now and then, I like to staple my embellishments on my projects. I like how it looks. Here’s another layout I created of my little man and I. I love this boy more than anything in this world. He is quite a kid. Notice the layers… again. I LOVE playing with patterned paper and embellishments. It’s my favorite thing to do in my spare time. I couldn’t help it. I had to use the pencil and what better way to use it then to add it at the bottom next to my journaling. 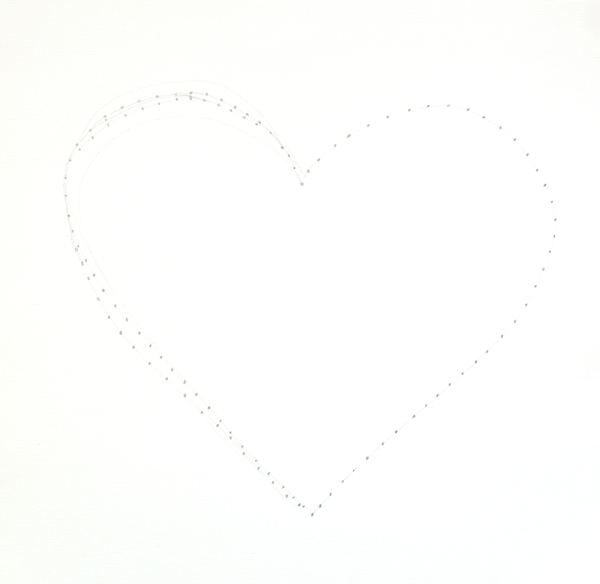 I layered the die cuts using a foam square then added a puffy heart sticker. LOVE these itty bitty hearts! To help pull the layout together, I added a big title at the top of the layout. I hand cut the “I think about you. A lot.” sentiment from a die cut and adhered it at the top of the gold title using foam squares. I really like how this layout turned out. So cute…so us. 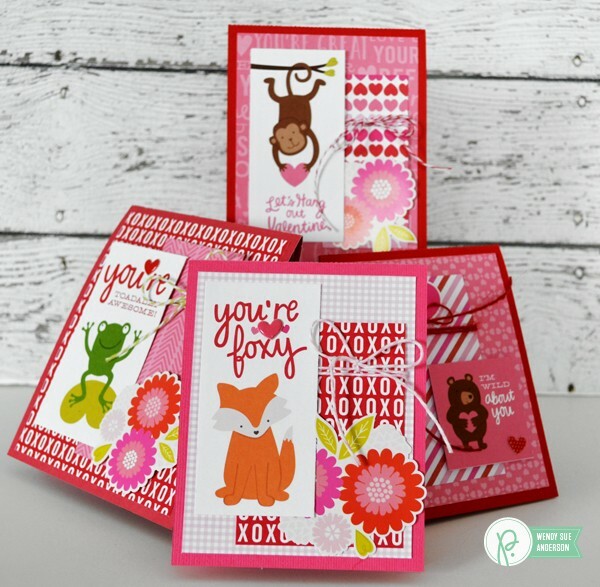 And here are a few cards I created with this adorable collection! 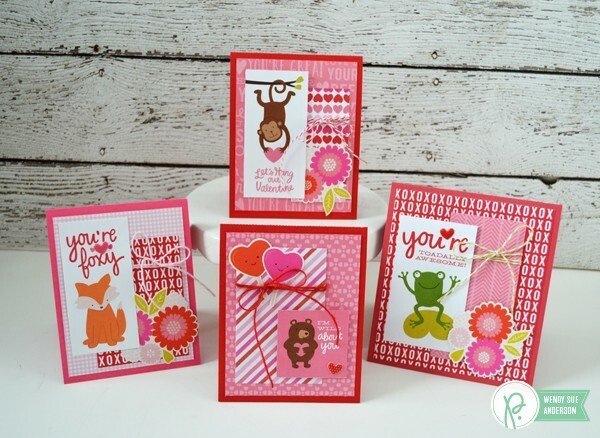 These cards are all 4″x4″. I find this size to be easier to work with when making cards. I used several pieces of die cuts and stickers to create these cards. 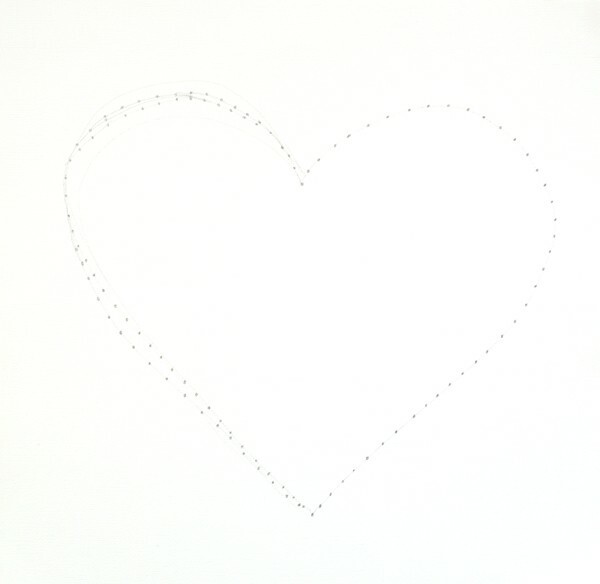 I cut the background from 6×6 paper pads. I hope inspired you today with my projects. 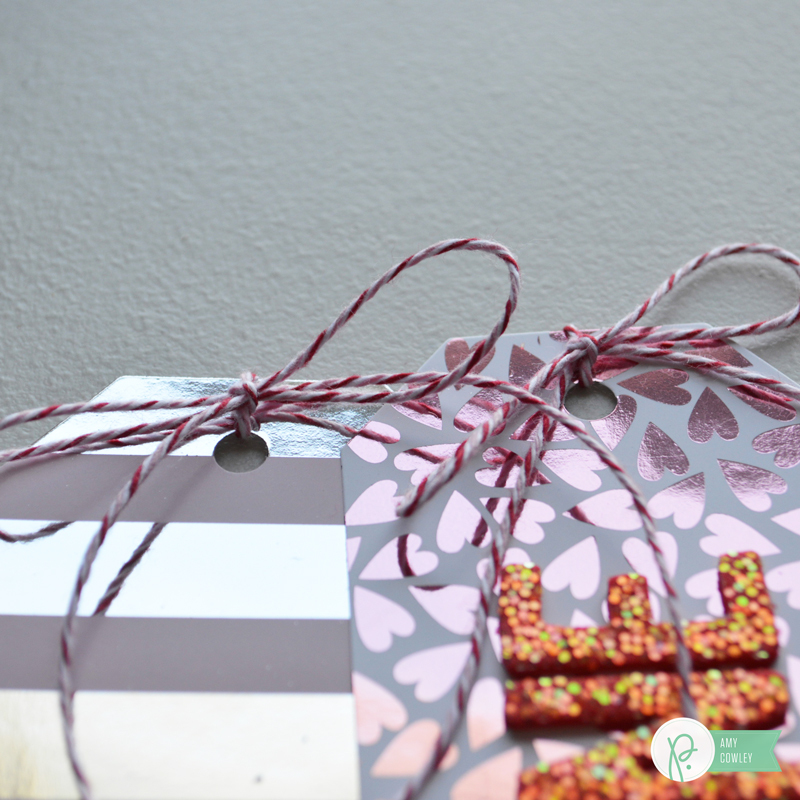 I had a wonderful time creating these projects for today’s guest post. Thank you Pebbles Inc. for giving me the opportunity to guest design for you! Have you seen the Pebbles Be Mine Collection? Oh, it is SO adorable! 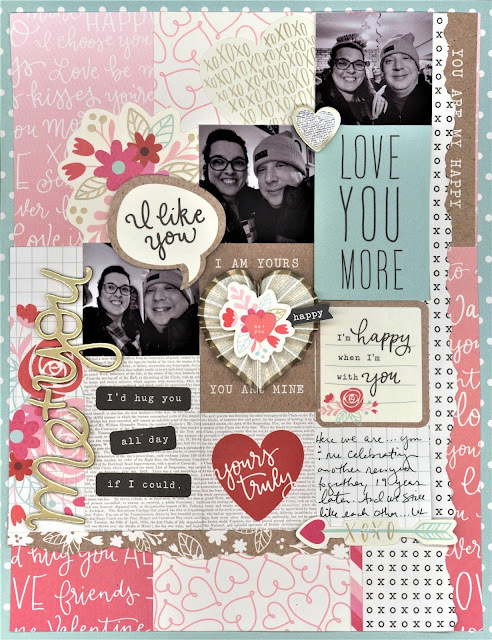 Amy here from The Happy Scraps today, and I had SO much fun playing with this collection. So much pink and red goodness. 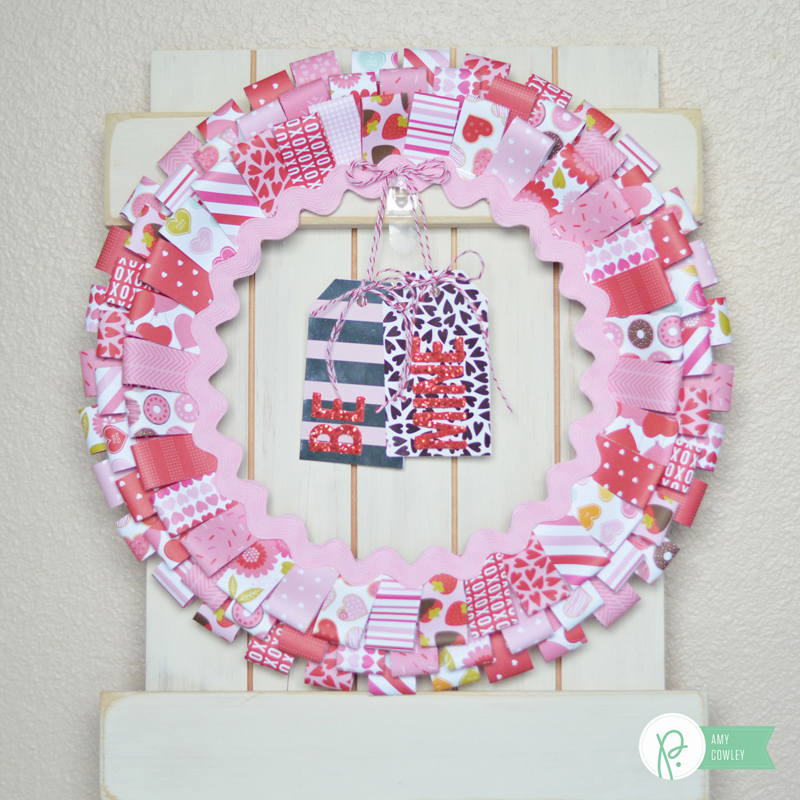 Today I’m going to show you how to make this Be Mine Valentine Wreath. 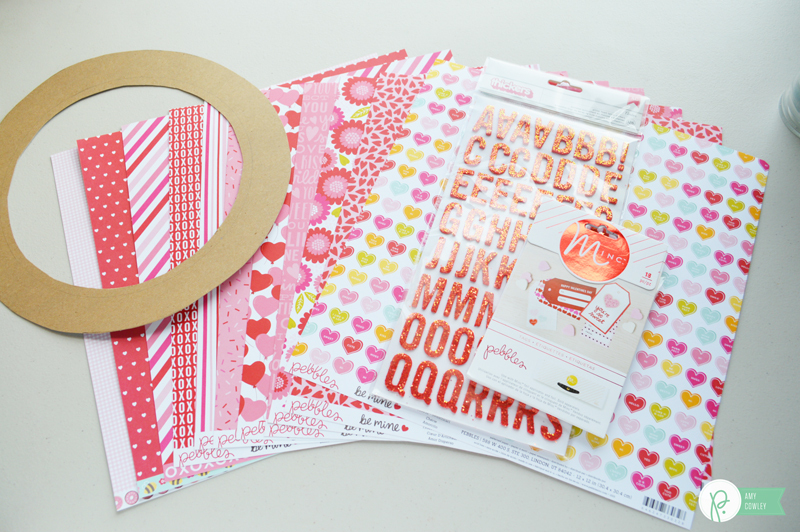 Collect all the Be Mine paper you’d like to use, along with the Valentine Minc Tags and the Be Mine red glittered thickers. 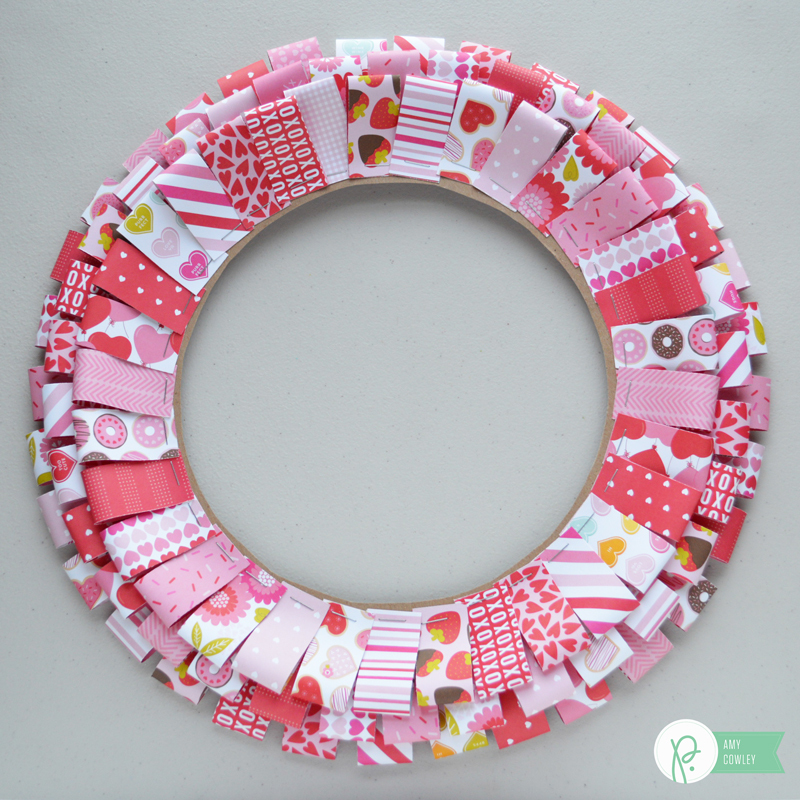 I created my own wreath form out of chipboard, tracing a circle, then cutting it out. 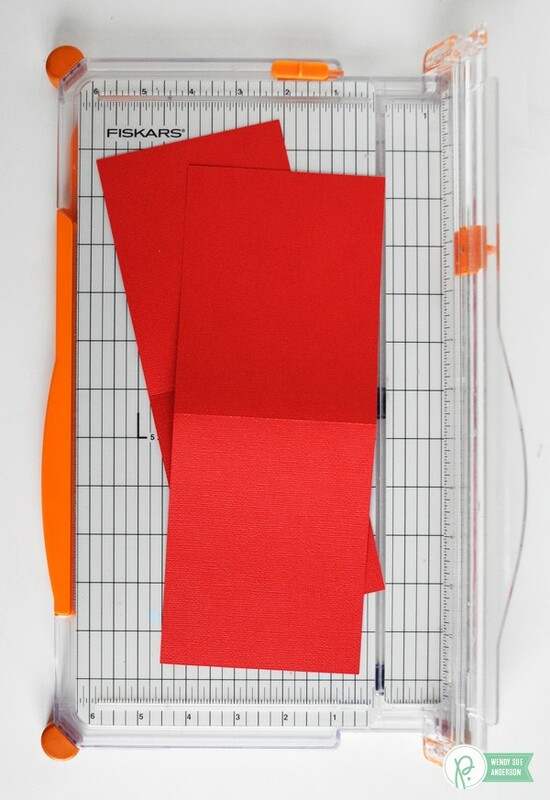 Start by cutting several strips of paper to be 1″ x 4″. 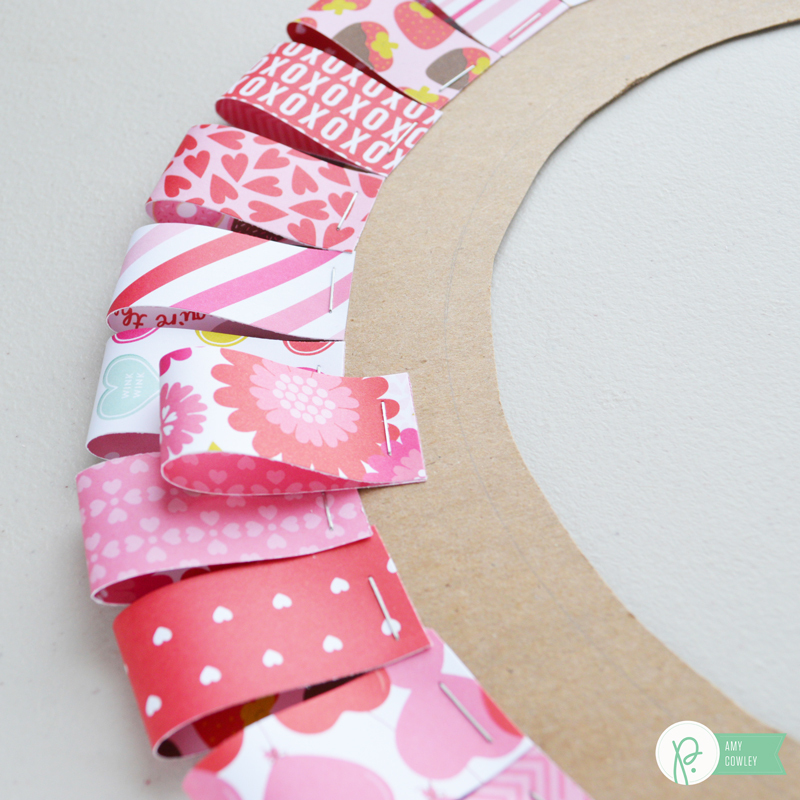 You’ll bend each strip of paper, placing it on your chipboard wreath form, and then use a stapler to secure it to it. 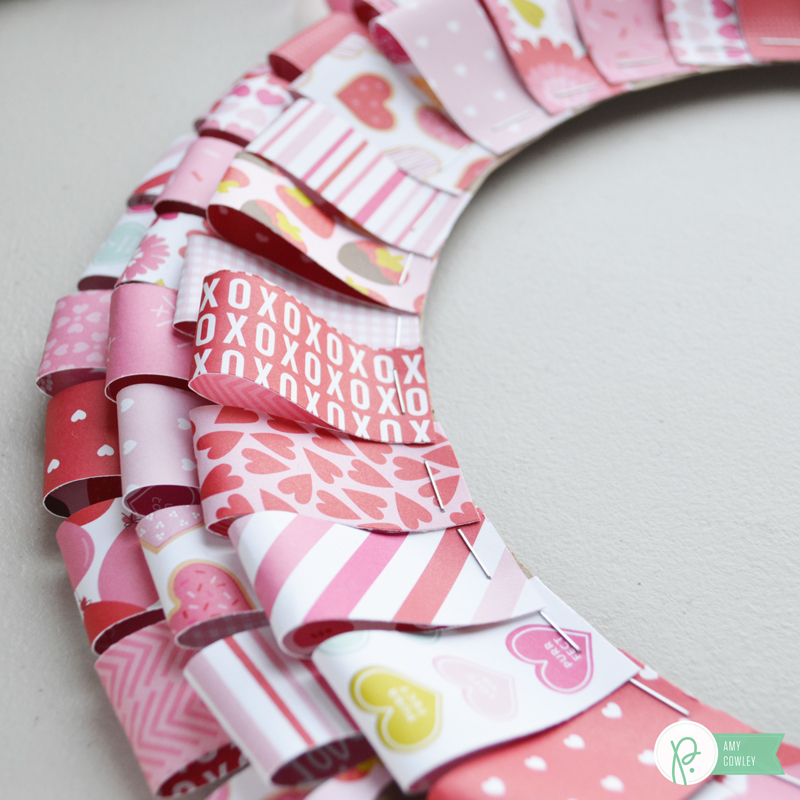 Continue all the way around your wreath form, then start on the second row, offsetting it slightly. For mine, I ended up with three rows. Because I wanted to cover the staples that were showing, I trimmed the extra chipboard out of the center, so I wouldn’t have as much area to cover. I got out my Sticky Thumb Cordless Glue Gun so I could attach some ric rac to the inner edge of the wreath. I just put a little glue down at a time, and then placed the ric rac on it. I continued around the entire wreath doing this. 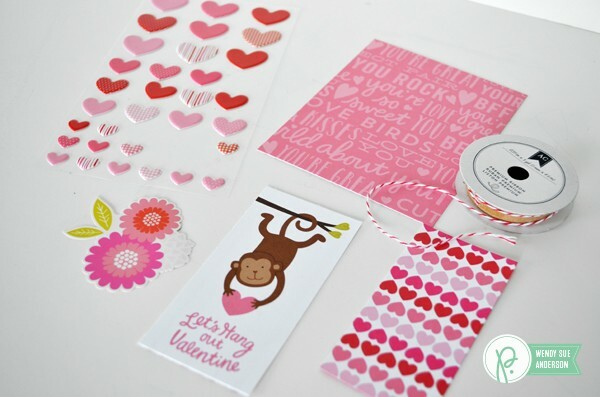 I pulled out the Valentine Minc Tags and the Minc Foil Applicator machine, along with some pink and silver foil. 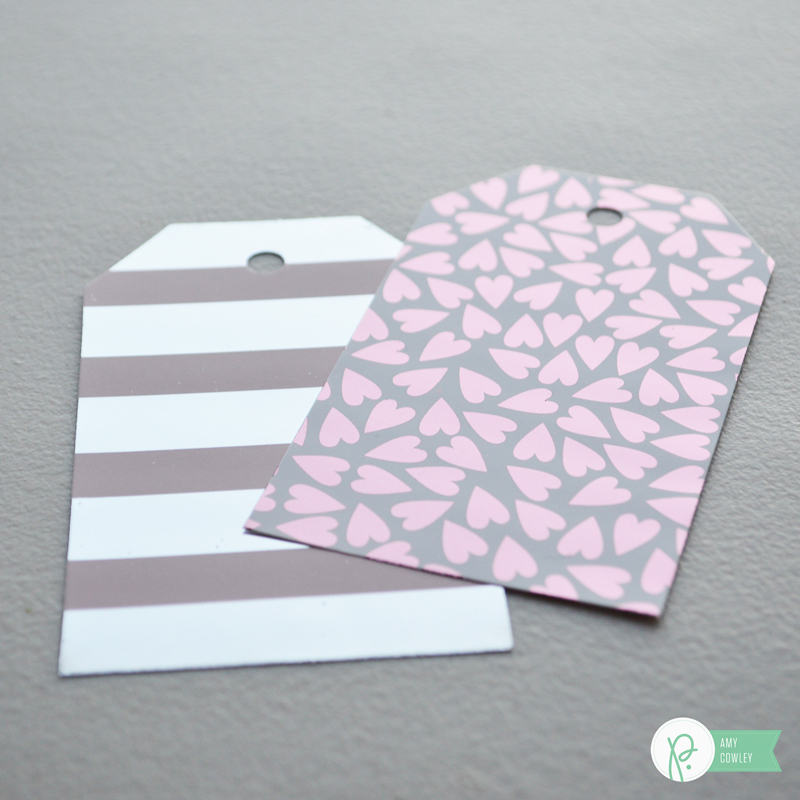 I added the silver and pink to these tags, making it a perfect match to the Be Mine Collection. I attached both of the tags together using adhesive on the back, making sure that they would stay where I wanted them for the wreath. 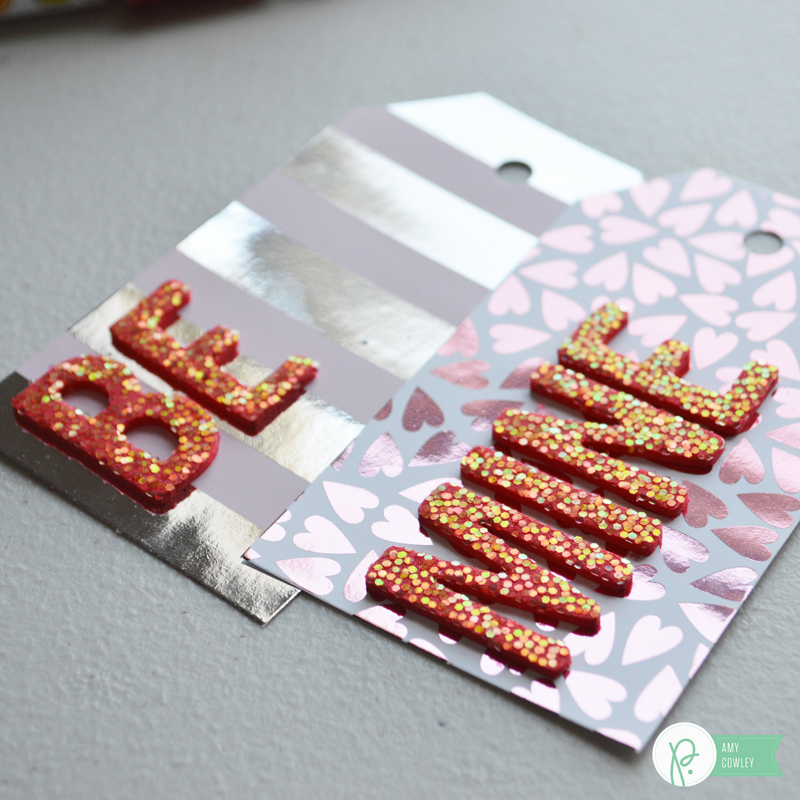 Using the red glittered thickers, I attached the words BE MINE. Next I tied a baker’s twine bow to the top of each tag. Using two strands of baker’s twine, I tied a bow and attached it to the wreath. With the tails of the baker’s twine from the bow attached to the wreath, I turned over my foiled tags, and put some adhesive on each, then I placed the baker’s twine tails onto the adhesive. 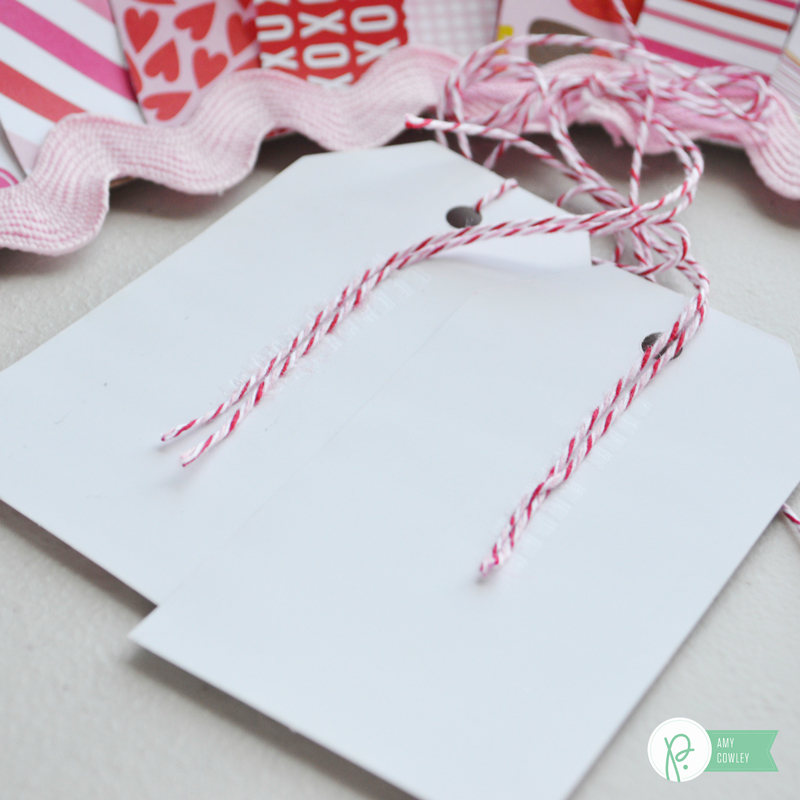 It created the perfect way to hang the tags! You’re wreath is all finished! You didn’t even need to head out and find a wreath form! But wait…there’s more! 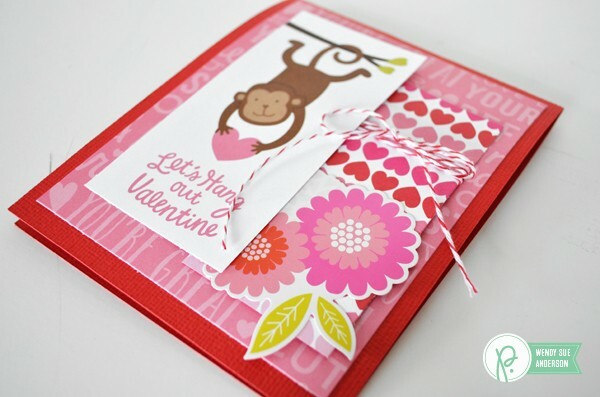 Not only are the fronts of these cards cute, but there’s a big surprise inside! 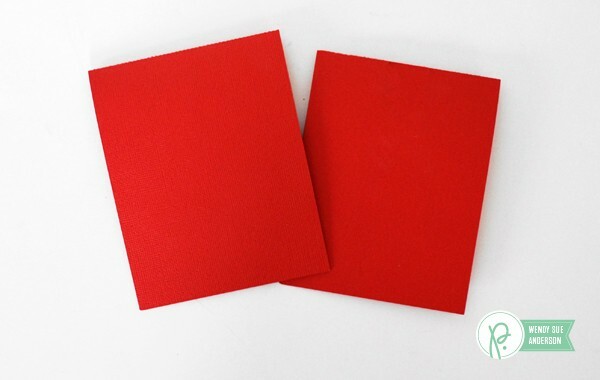 First, you’ll need one sheet of 12×12 cardstock for each card base. 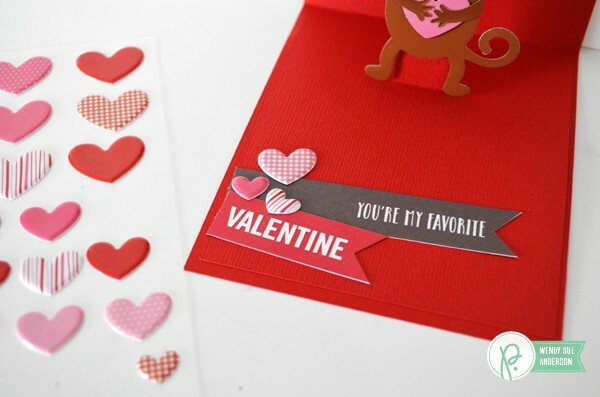 You need to cut one card base (any size you wish), and a second one about 1/4″ smaller all around. After they are cut, score and fold them in the middle. (these cards should open from the bottom up, not from the right side). 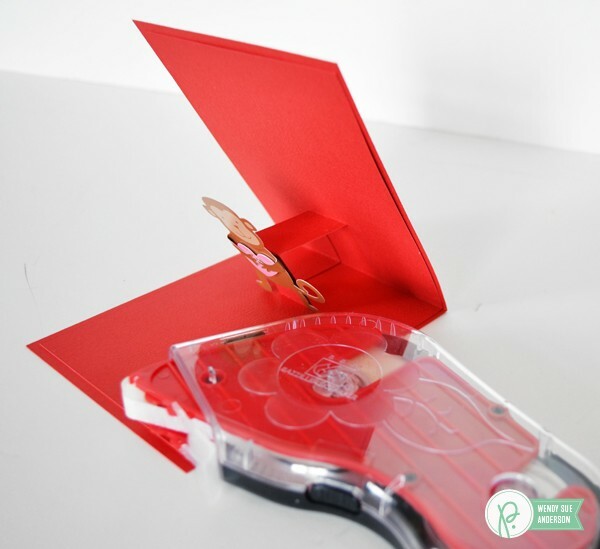 Now use adhesive to place the small card base inside the large one. Don’t glue the pop-up tab! These little characters make the cutest pop-ups! 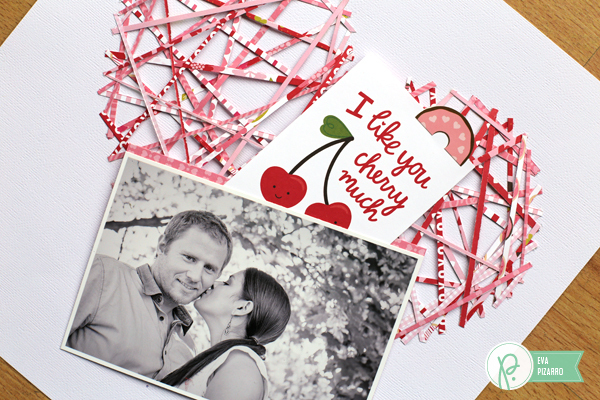 Have fun making special punny pop-up cards for your sweeties! Hello everyone! 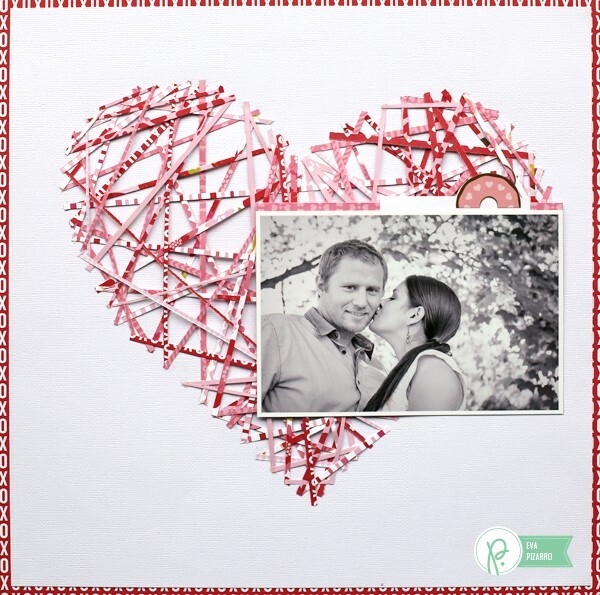 I’m Eva Pizarro and today I bring you a layout inspired by string art. 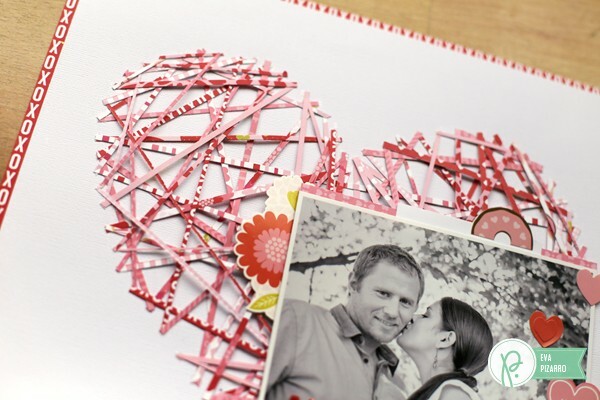 I love this technique and it is so on trend right now that I decided to incorporated into my layouts but with a twist: instead of strings I used tiny strips of paper. I am not going to lie, it takes some time to complete your project, but I promise you the result is worth it. 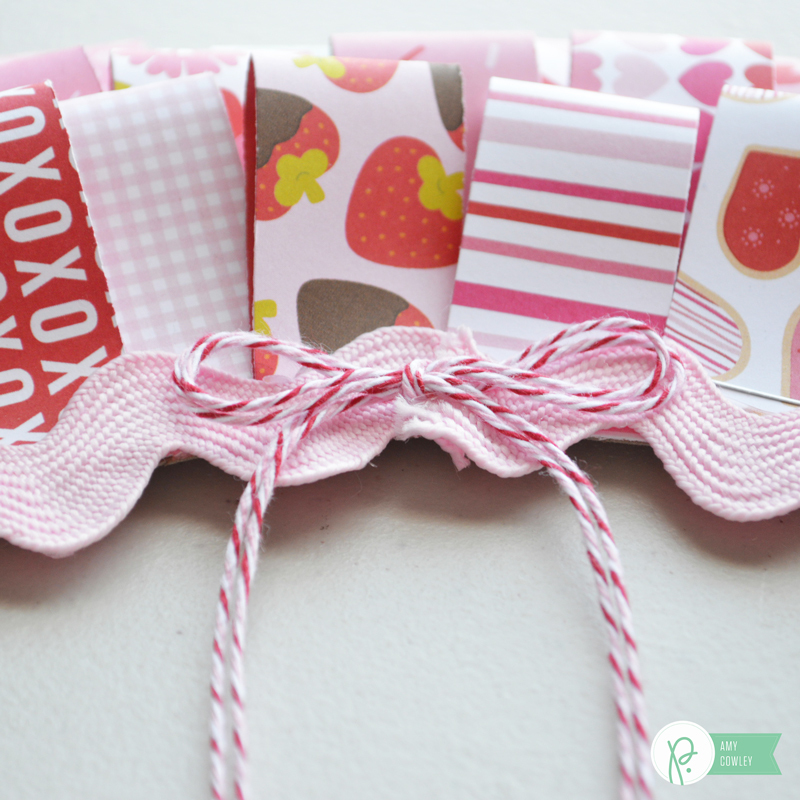 The depth of the strips of paper is gorgeous and I think it would be very fun to do small images and hang them as decorations on your home. 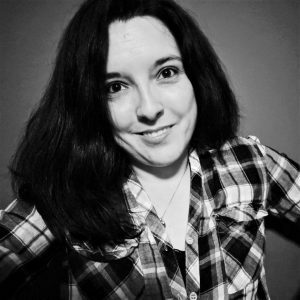 Maybe some animals in your kid’s room? that would be lovely! To make the string art piece you need to draw a shape and mark small points where you are going to glue your strips. Don’t worry if you don’t have drawing skills, just try two or three times like I did until you are happy with the results. 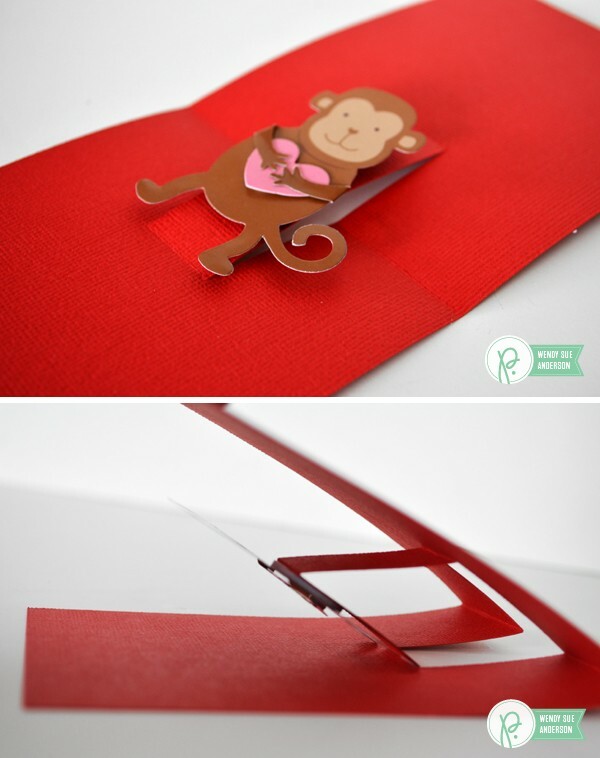 Cut very fine strips of paper, erase the lines of your design and glue your strips to your paper. 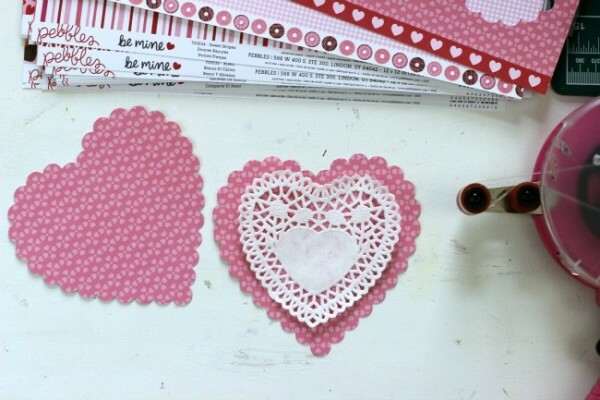 Begin in one dot and move another one, then glue another strip from that same do to another one and so on. when you are finished your shape would look like this. 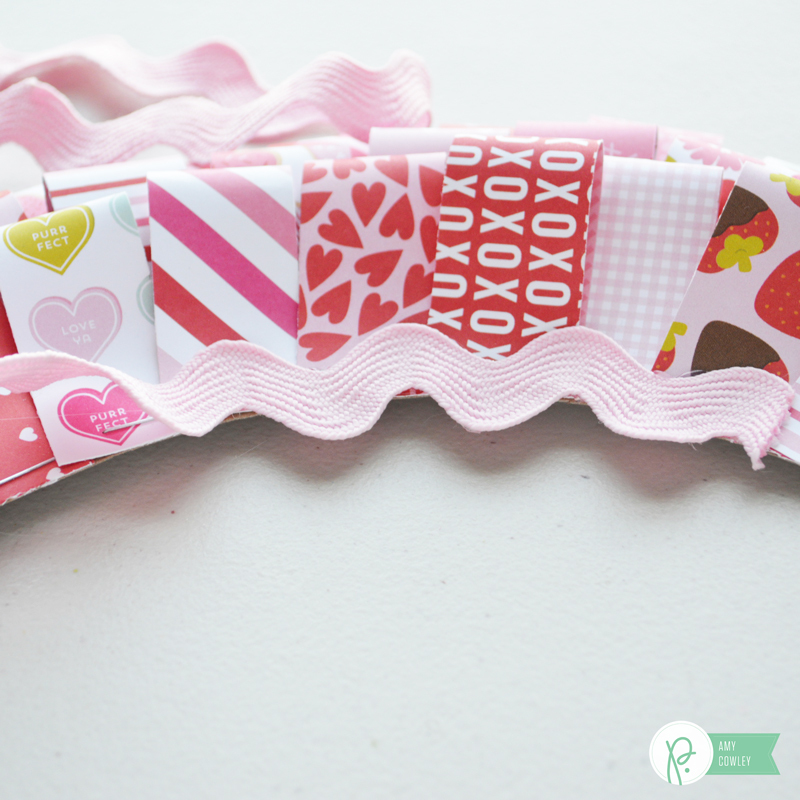 I love that some of the strips bend a little giving a lot of dimension to the heart. 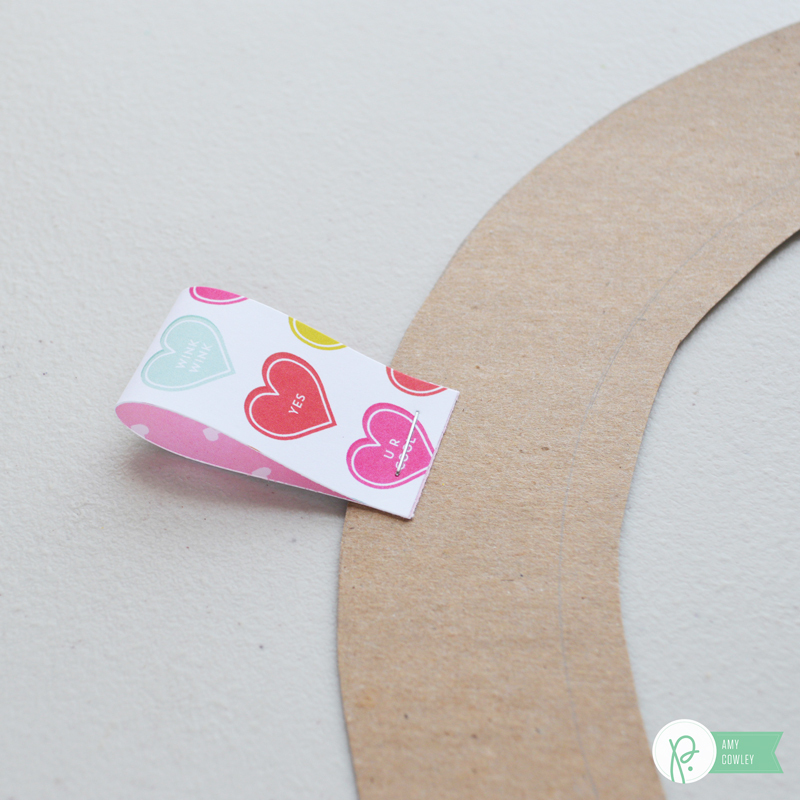 Create a hidden pocket by glueing a piece of paper to the back of your picture. Inside I put a journaling card and glue a donut sticker cut in half to make a tab. 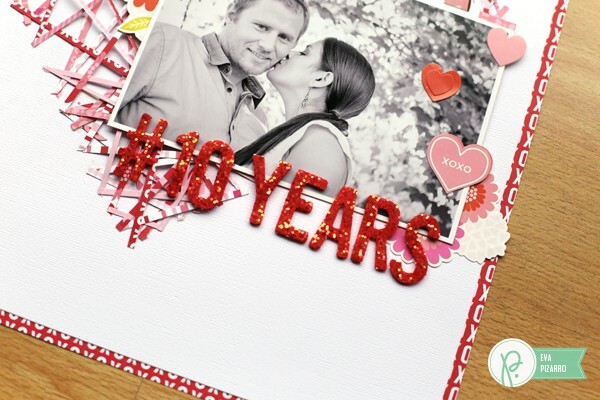 Glue your photo and your white paper to your base. Embellish with some stickers from the same collection and add your title. 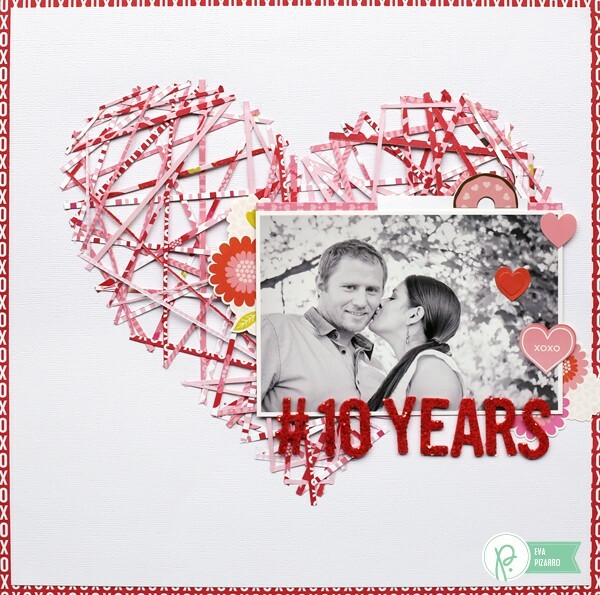 This year my husband and I celebrate our 10th anniversary so this layout is dedicated to that wonderful event! Love this glittery alpha, it has chunky transparent glitter on top and shines beautifully. I wrote my journaling in the card and put it on my secret pocket. Did you like this technique? I hope you did and that you try it at home! if you do please share your creations with us! Hi Pebbles fans! 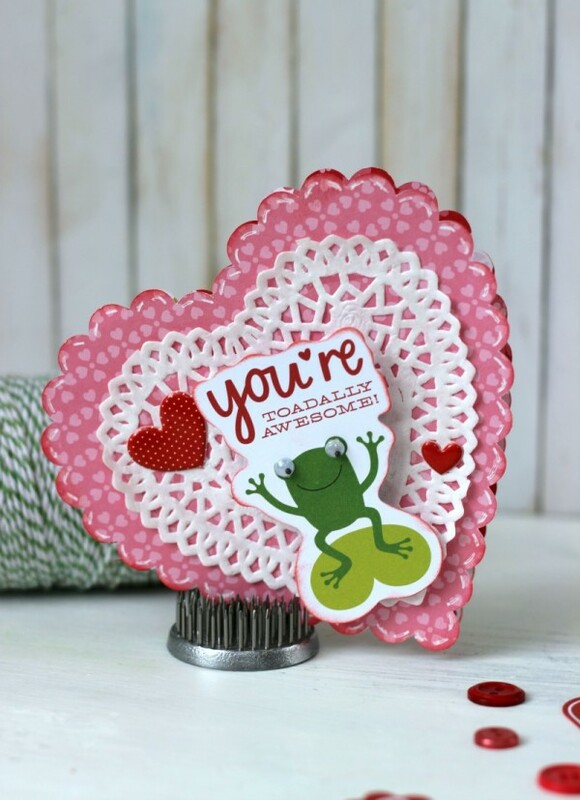 Holly here from Ribbons & Glue sharing with you a Valentine’s Frog Card made from the adorable Be Mine collection. 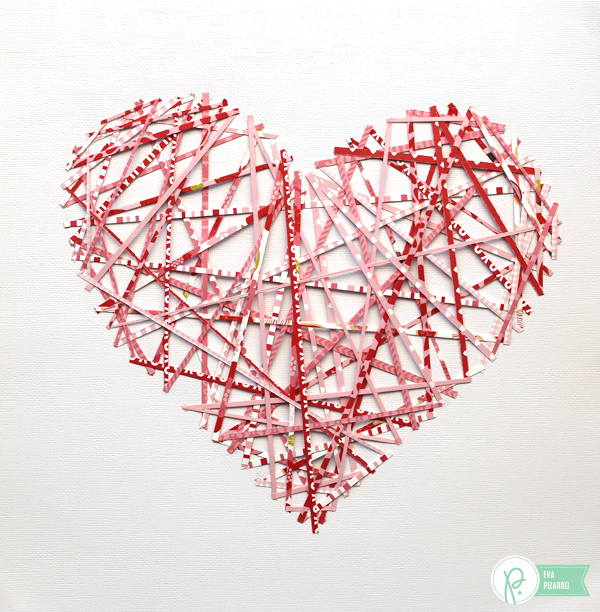 Valentine’s crafts are my total favorite. 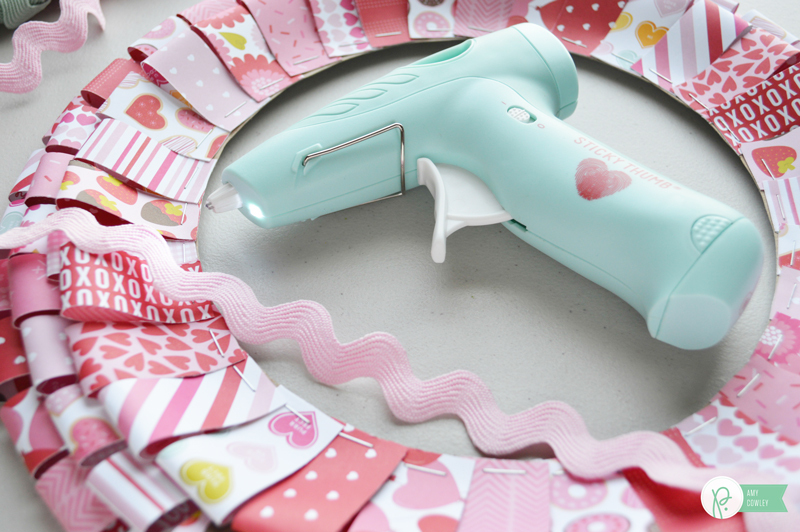 This card was really simple to make using my Silhouette and the adorable embellishments found in the Be Mine collection. 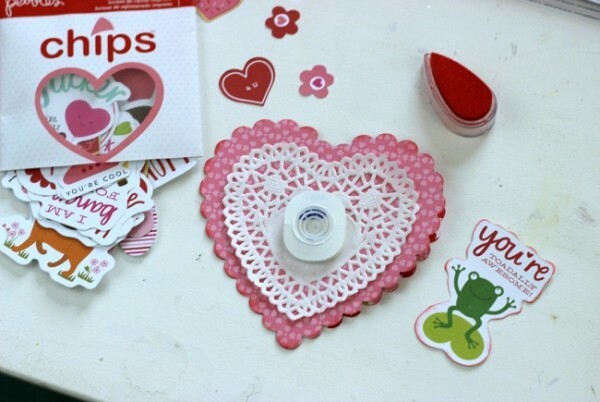 To make this Valentine’s Frog Card, I used my Silhouette to cut out a Candy Heart cut file twice, attached the two pieces together along the sides to make it in to a card then adhere a heart doily on the front. Since I chose to use the cute frog card stock shape, I attached him on to an Action Wobble on the front of the card so when the card held, a little but of wobble happens. Reminds me of a frog jumping. Cute, huh? 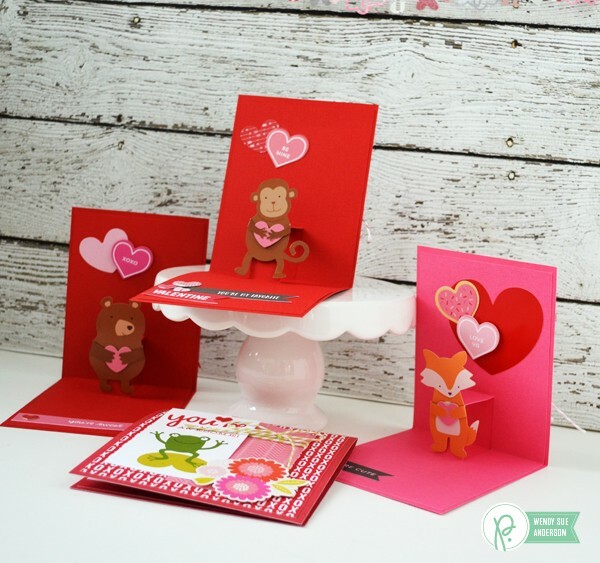 I hope this Valentine’s Frog Card inspires to create unique and fun cards this Valentine’s Day using the Pebbles Inc. Be Mine collection.